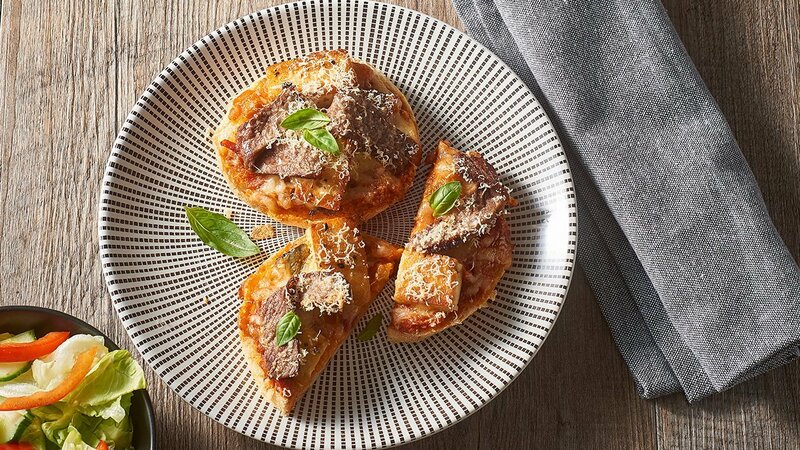 Bringing a mini Italian delight to your menu, yet with a twist of Tuscan veg gives this mini delight a full-bodied flavour your residence will love. Cut each muffin in half and lay cut side up on a baking tray lined with grease proof paper. Take the KNORR Professional Mixed Peppercorn Puree and cover the scotch fillet. Heat a griddle pan and seal both sides. Set aside ready to use. Spread each half of the muffins with the KNORR Italiana Tuscan Vegetable Sauce GF and sprinkle with shredded mozzarella. Add the Halloumi and sliced peppered scotch. Sprinkle with fresh shredded parmesan cheese and place in the oven. Bake for 8-10 minutes at 190 degree Celsius.